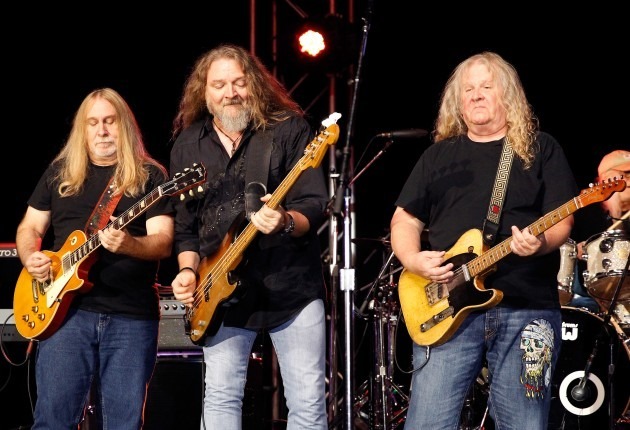 Known as “southern rock royalty,” The Kentucky Headhunters are gearing up to take their rowdy, high-energy live show across the pond, as they return to the U.K. for a string of performances this fall. Supporting the American band will be U.K. rockers Bad Touch, who will join the Headhunters on all 8 shows this October. 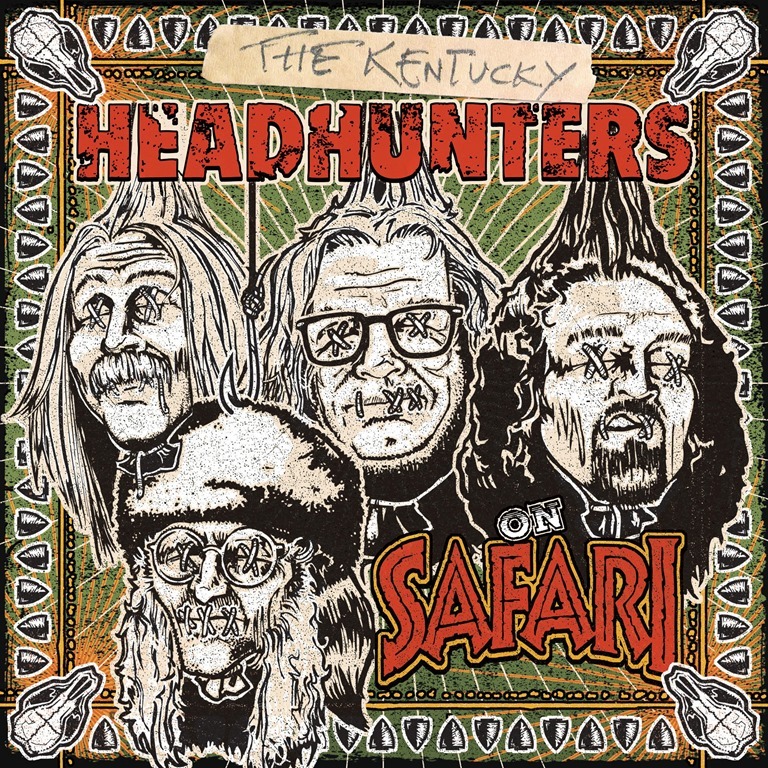 The Kentucky Headhunters have been crisscrossing North America fresh off the 2016 release of On Safari, the band’s 12th studio album. A Plowboy Records/Practice House Records joint venture, the album combines southern rock, blues, Americana and country sounds sure to captivate audiences overseas. Click here to purchase On Safari. The week of May 29, tune into The Heartland Network as members of the band look back on some of their most stand-out career memories. The half-hour interview show airs all week on various affiliates, check local listings here. Stay up-to-date on all happenings on the road with The Kentucky Headhunters by following updates on their official website www.kentuckyheadhunters.com and on Facebook and Twitter! May 26 The Cumberland County Playhouse – Crossville, Tenn.
June 03 Ward Nail Park – Lowell, Ark. June 17 Hatbox Airfield – Muskogee, Okla.
June 23 Indian Lookout Country Club – Pattersonville, N.Y.
June 24 Billing Rock, Ribs and Ridges Festival – Augusta, N.J.
July 01 Jackson Douthitt Park – Jackson, Ky.
July 02 Concert on the Water – Arley, Ala.
July 08 Tolchester Marina – Chestertown, Md. July 14 Anderson Music Hall — Hiawassee, Ga.
July 15 Downtown Summer Nights – Decatur, Tenn.
July 28 Fayette County Fair – Dunbar, Pa.
July 29 Ozarks Amphitheater – Camdenton, Mo. Aug. 05 Race Days Festival – Raceland, Ky.
Aug. 10 Elk County Fair – Kersey, Pa.
Aug. 11 Mason County Fair – Point Pleasant. W. Va.
Aug. 12 Francis Marion University Performing Arts Center – Florence, S.C.
Aug. 18 Taylor County Fair – Grafton, W.Va.
Aug. 19 Harley Davidson of Atlanta – Lithia Springs, Ga.
Aug. 25 Crawford County Fair – Gays Mills, Wis.
Aug. 26 Chattooga County Ag Fair – Summerville, Ga.
Sept. 02 The Shed – Maryville, Tenn.
Sept. 14 Warren County A&L Fair – McMinnville, Tenn.
Sept. 15 Eldorado Town & Country Days – Eldorado, Ill.
Sept. 16 Tradewater Music Fest – Providence, Ky.
Sept. 23 Big Spring Park for Bridge Bash – Cotter, Ark. Sept. 30 Gram Parson’s Guitar Pull & Tribute Festival – Waycross, Ga.
Oct. 02 Robin 2 – Bilston, U.K.
Oct. 03 Rescue Rooms – Nottingham, U.K.
Oct. 05 Local Authority – Sheffield, U.K.
Oct. 06 Waterfront – Norwich, U.K.
Oct. 07 Boston Music Rooms – London, U.K.
Oct. 08 Club Academy – Manchester, U.K.
Oct. 09 Cluny – Newcastle, U.K.
Oct. 10 O2, ABC2 – Glasgow, U.K.
Oct. 14 Jenny Wiley Festival – Prestonsburg, Ky.
About The Kentucky Headhunters: Known as “Southern Rock Royalty” and the “great American rock ‘n’ roll band,” The Kentucky Headhunters have maintained a longevity most acts can only dream about. With a GRAMMY® Award, two Top 10 charting albums, four consecutive Top 40 hits and countless other honors, The “Heads” are credited for creating a unique blend of honky-tonk, blues, and southern rock that appeals to the toughest music critics and listeners of all kinds. Getting their start in 1968, brothers Fred and Richard Young and cousins Greg Martin and Anthony Kenney, from Edmonton, Kentucky, formed Itchy Brother, which later morphed into The Kentucky Headhunters after Kenney departed and Doug Phelps joined the band. Their first album, Pickin’ On Nashville, (1989), surprised the world when it became a major success, selling over two million copies. Their 2015 release Meet Me in Bluesland, included the last vocals ever recorded of the late, great pianist Johnnie Johnson — Rock N Roll Hall of Famer and legendary keyboardist for Chuck Berry. The album reached the No. 1 spot on the Billboard Blues Album chart the week of its debut. It also garnered top placement on the Billboard Americana Chart. The band’s Fall 2016 release On Safari is a southern rock album that tips the hat to family and the southern way of life. 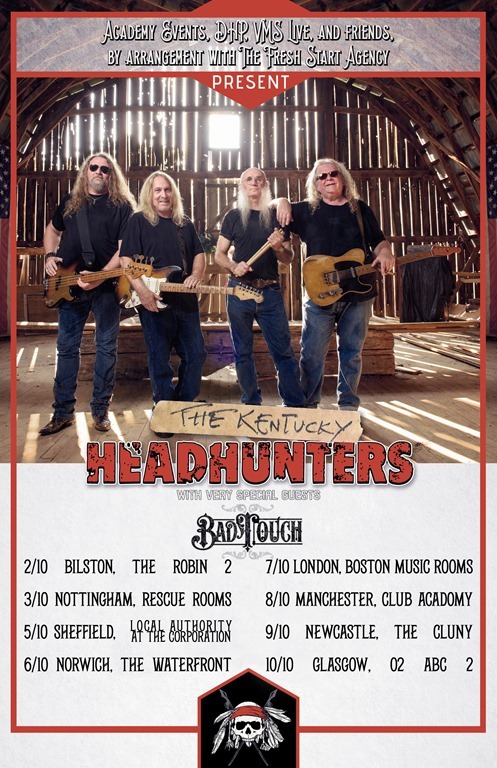 The Kentucky Headhunters still tour extensively throughout the United States and Canada, and recently completed their first-ever European tour. 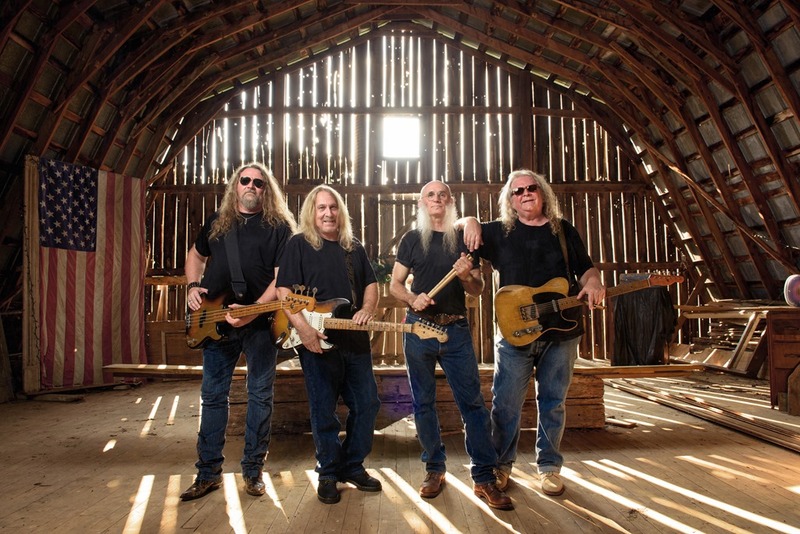 For more information on The Kentucky Headhunters, please visit www.kentuckyheadhunters.com.